March 21, 2013 – Jonathan Boland, GE, QSD and Janet Kan, GE, CEG, LEED AP, have been named Associates of ENGEO Incorporated. Since joining ENGEO in 2005, Mr. Boland has collaborated with developers, land owners, and public agencies providing geotechnical consulting, project management, and quality assurance for residential communities, hospitals, schools, water storage facilities, levees and other public works projects throughout California and Nevada. “My colleagues are top notch professionals and I’m so pleased to be a part of this remarkable team,” says Boland. Mr. Boland leads a group in the Rocklin office. Originally from San Diego, California, Boland received his BS in Civil Engineering from Cal Poly San Luis Obispo and an MS in Civil Engineering from UC Davis. He is a member of ASCE, PAGES, and participates in ACEC functions and events. In his spare time, he is an active member of the Rods & Relics car club and enjoys driving his 1956 Pontiac Chieftain (he’s a self proclaimed classic car nut). Born in Hong Kong, Ms. Kan studied in Canada and worked in Seattle, then moved to California to obtain her MS at UC Berkeley in 2003. Immediately after graduation, she joined ENGEO. Janet is a registered Geotechnical Engineer and a Certified Engineering Geologist with over 10 years of experience. She has managed large-scale public projects such as BART to San Jose (SVRT), High Speed Rail and the new San Mateo County Jail. In addition, she is the project manager for various private residential, mixed use and master-planned developments. Aside from her work at ENGEO, she is an active member of American Society of Civil Engineers (ASCE) and is currently the San Jose Branch President. During her presidency, Janet is committed to promoting civil engineering to the public and to advance the quality and practice of civil engineering in the counties of Santa Clara, San Benito, Monterey and Santa Cruz. 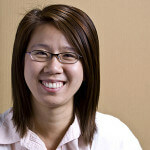 Ms. Kan is transferring from ENGEO’s San Jose office to lead a group in the San Ramon office in Summer 2013. “It is a great honor to work every day with my colleagues and clients, whom I deeply respect,” says Kan.